Peter Erickson hand-hammers each piece of Erickson flatware using a special forging anvil and other specialized tools and implements - many of them generations old. No machines are ever used - making each silver piece produced a labor-intensive and very special work of art. Erickson patterns have been handed down through the decades from the original 1800s design studio and workshop of Stone Silver. They make very special gifts. Ideas? Weddings. Birth celebrations. Or other life events where something memorable is called for. 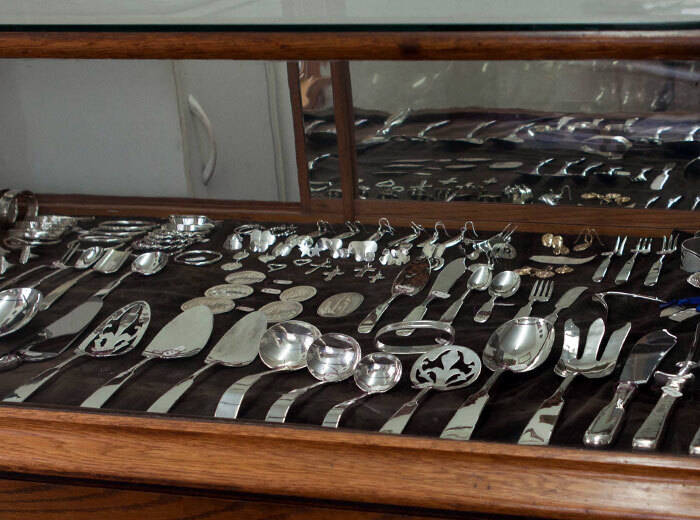 Erickson Silver offers everything from individual pieces - to full sets. 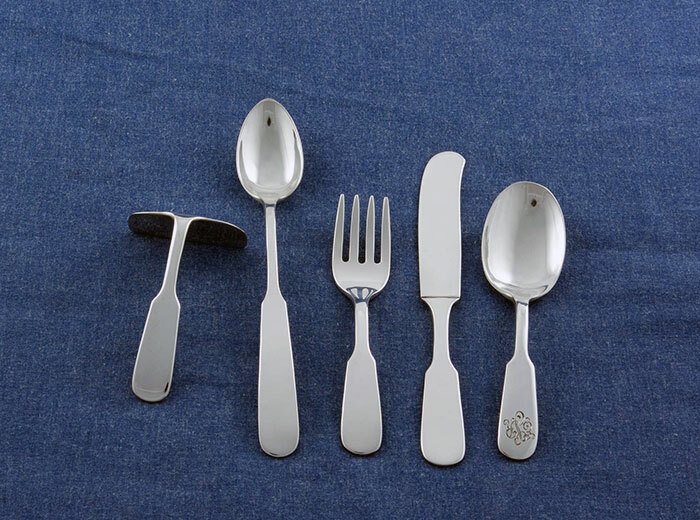 Choose from the many Erickson flatware patterns. 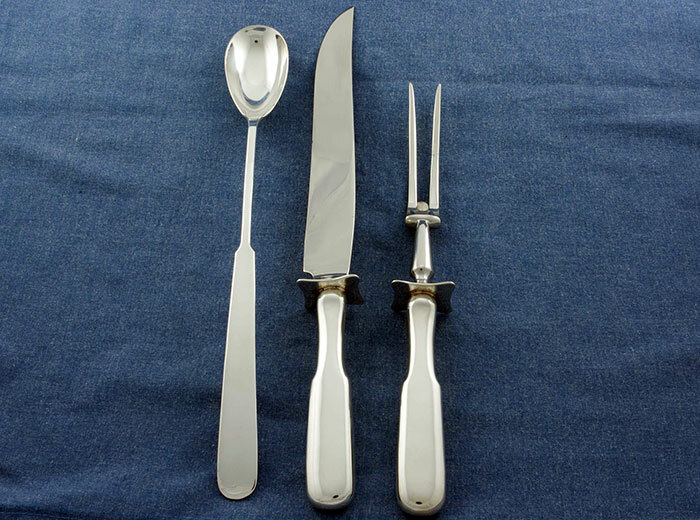 Just some options include full place settings, serving sets, salad sets, ladles, carving sets, baby flatware and much more. Simply call, visit or send us an email. 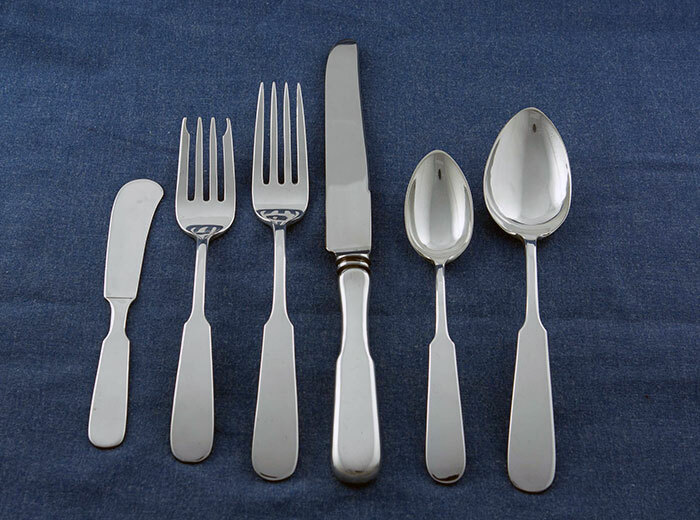 View our Flatware Item & Price List here and see a listing of all of the unique pieces available - from sugar tongs and salt ladles to fish knives and napkin bands. 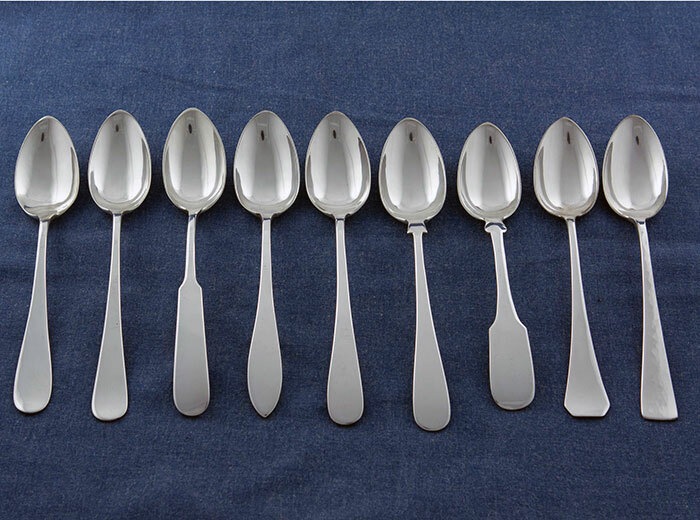 From left to right: Rose, Manchester, Chino, Princess, Hume, Gerber, Fiddle, Wellington and Swedish Classic. 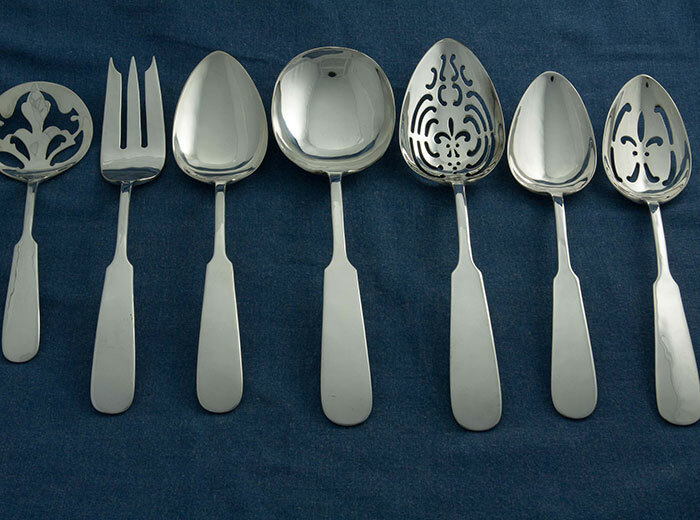 One of Erickson Silver's 9 Hand wrought Silver Flatware Patterns. This is our Chino Pattern. 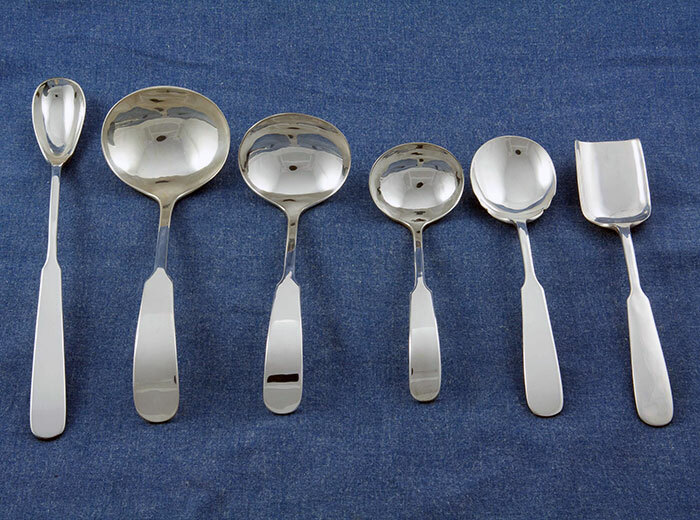 Small Pierced Tomato Server, Small Serving Fork, Small Serving Spoon, Large Berry Spoon, Large Pierced Serving Spoon, Tablespoon, Pierced Tablespoon. 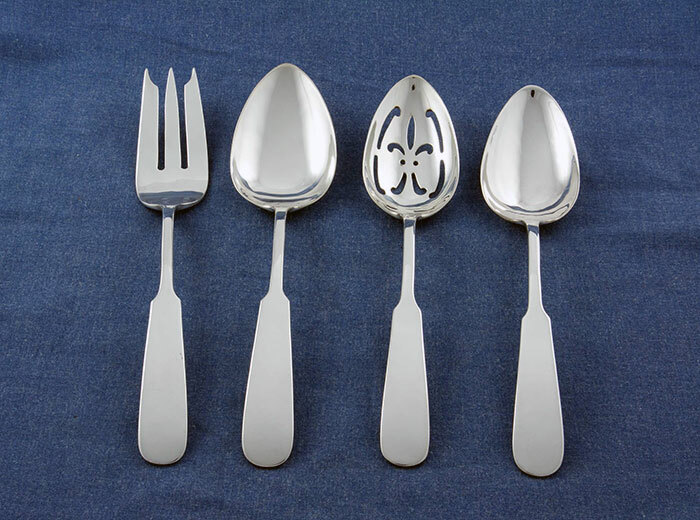 Some Erickson Silver Serving Piece close-ups - Small Serving Fork, Small Serving Spoon, Pierced Tablespoon and Regular Tablespoon. 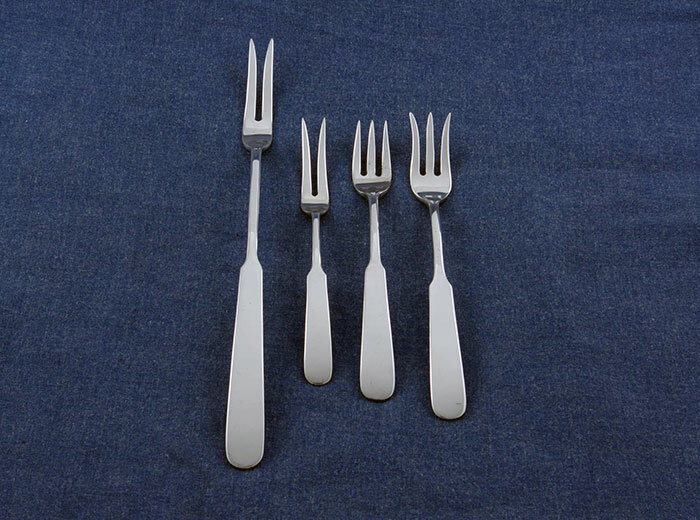 Erickson Silver Specialty Forks include the attractive Cold Meat Fork, Lemon Fork, Oyster Fork and Pickle Fork. 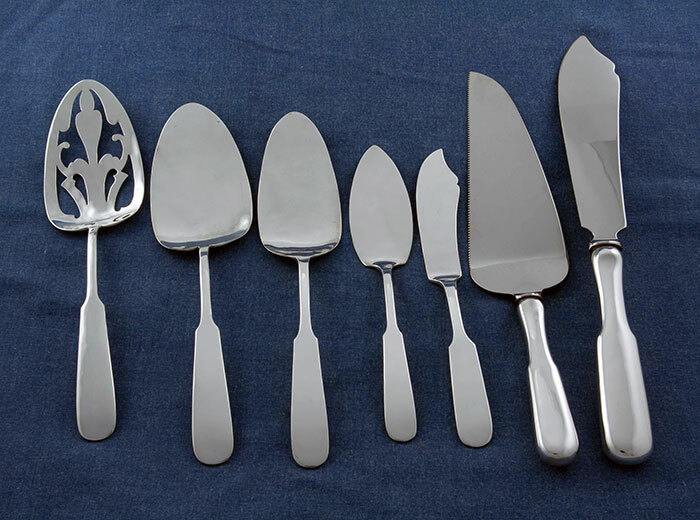 Consider our Pierced Pie Server, Solid Pie Server, Cake Server, Cheese Server, Butter Knife, Pie/Cake Server and Cake Knife (with stainless steel blade). Ladles for Cream, Gravy and Mayonnaise. 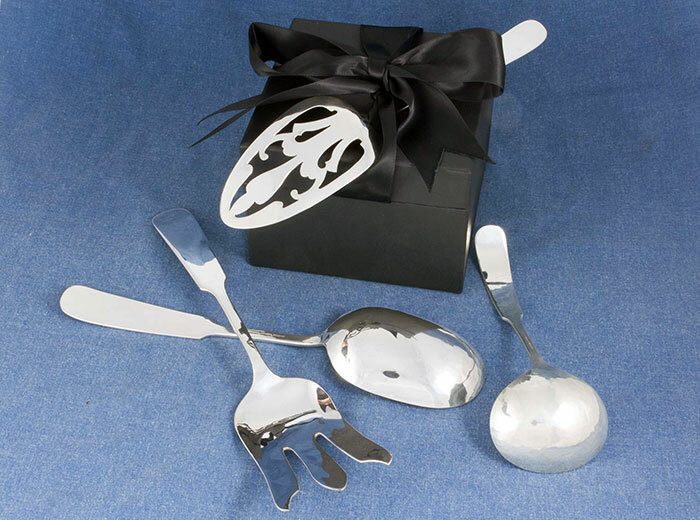 Enjoy 3 special spoons - Iced Teaspoon, Jelly Spoon and Sugar Shovel. 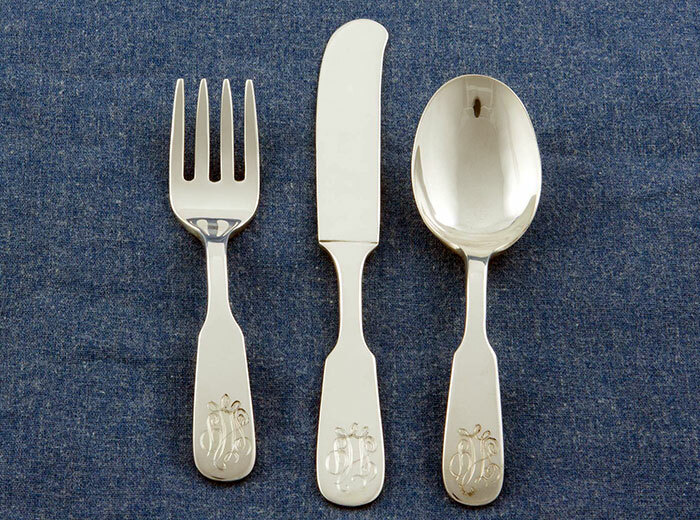 Enhance any table or collection with our Small Pierced Tomato Server, Large Berry Spoon and Large Pierced Tablespoon. Erickson Silver's Carving Set - 2 piece with hollow handle and 7” stainless blade. 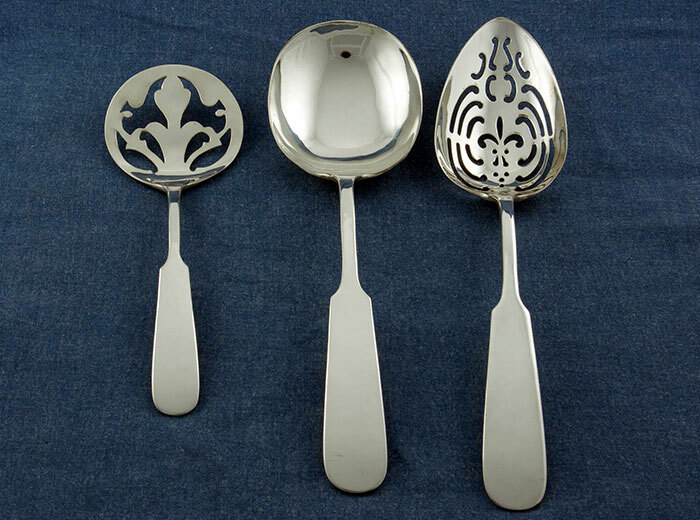 Also, shown on the left, our Pitcher Spoon, 12 1/4” long. This is the largest of the three sizes of salad sets that we offer. 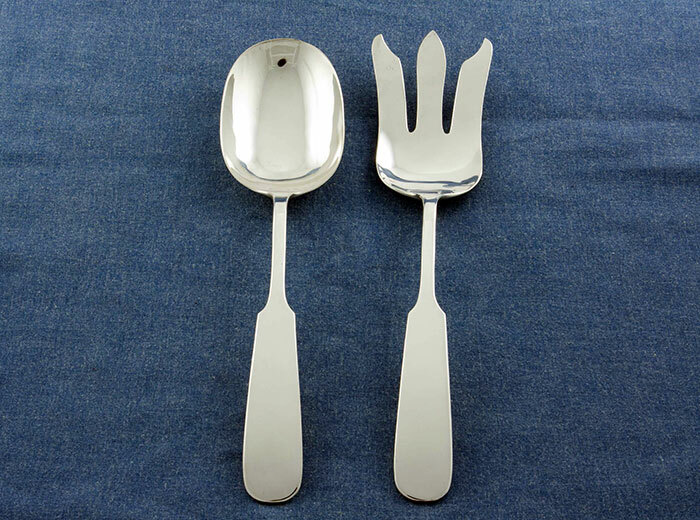 The gleaming spoon is 9 ¾” long x 2 3/8” wide and the fork is 10” long and 2” wide. Begin giving them treasures at an early age. 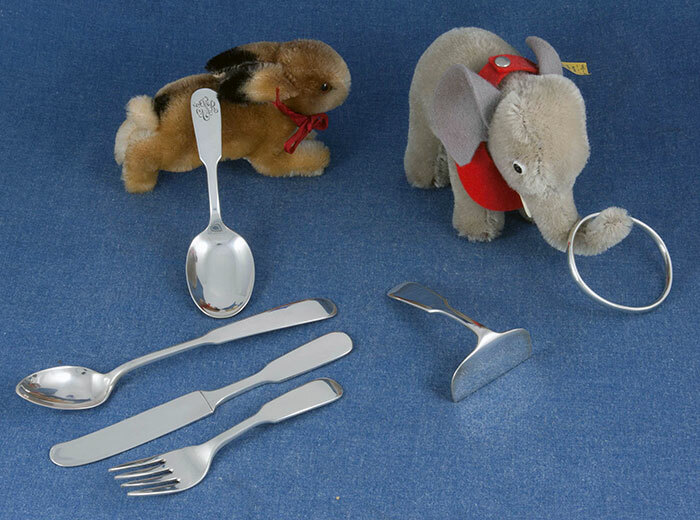 Our Baby Flatware Set is an instant heirloom and the ultimate in thoughtful gifts. Hours: Open Mon-Fri 9am-4pm and by appointment. Occasionally we have to step out, so if you wish, call first. Peter Erickson thanks his grandfather, George, for passing on his knowledge of more than 60 years as a master craftsman of silver...and for awakening his love of silver smithing. Erickson Silver was born from the Arthur J. Stone Silver Shop, 1901-1937, with drawings, "scales" files, catalogs and more in the Smithsonian Archives of American Art. You can discover more about Peter's family's tradition of silversmithing in the city of Gardner, MA here. Or read a newspaper story about Peter's and Gardner's historical 'love affair' with silver. © Copyright 2013-present. Erickson Silver. Site photography by David Woodford Photography. Site developed and curated by ComfortZones Communications, Inc. Call 978-827-3141.